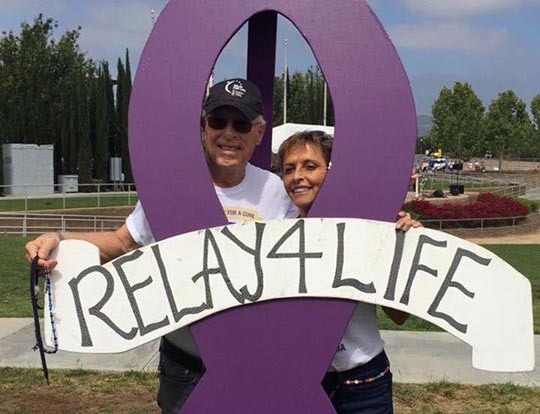 Mesothelioma survivor Andy Ashcraft unexpectedly took on the role of caregiver Sunday morning when his wife and caregiver, Ruth Ashcraft, collapsed at an American Cancer Society Relay For Life event in Murrieta, California. Ruth was rushed to a nearby hospital, where she was diagnosed with pneumonia and physical exhaustion. Ruth has been instrumental in the long-term care of Andy, who was diagnosed with malignant pleural mesothelioma on May 13, 2010. He was 63. This was the fifth consecutive year they participated in the Relay For Life fundraiser, a 24-hour walking event that began Saturday morning at Town Square Park. Ruth walked more than 20 miles before feeling ill.
Andy left his wife’s hospital room Monday for a previously scheduled checkup with his oncologist. The doctor found nothing concerning, which sent him back to the hospital to help care for Ruth. Despite having a cancer with no known cure, Andy believes his wife is the main reason he is alive today. They celebrated his six-year survival anniversary Friday, a day before the Relay For Life event began. Ruth was the catalyst behind his cannabis oil treatment regimen, which they now believe has allowed him to fight the cancer. Cannabis oil is a form of medical marijuana, which is rapidly gaining acceptance in the complementary and alternative medicine community for its anti-cancer properties. Doctors originally gave him a 12-month life expectancy, but he had some success with an immunotherapy drug clinical trial. When the drug stopped working in early 2013, the tumors began growing rapidly again, sending him into hospice care for his final weeks. That’s when he turned to cannabis oil. Andy’s fight has made him a beacon of hope for many cancer patients, as well as a testament to alternative treatment, a belief in God and a positive attitude. There were 31 teams and 641 participants at the two-day weekend event. Andy and Ruth’s team, Strollin’ for a Cure, raised a personal best of $8,223. For the first time, they reached Relay For Life’s $7,500 Platinum Fundraising Club level. Andy Ashcraft and his wife, Ruth, at Relay For Life in Murrieta, California. Among those contributing to the Strollin’ for a Cure team were Asbestos.com and the Asbestos Disease Awareness Organization. Mesothelioma is a rare, aggressive cause caused by exposure to toxic asbestos fibers. Relay For Life is now a worldwide movement. It began in Tacoma, Washington, in 1985, when Dr. Gordon “Gordy” Klatt circled a track for 24 hours. He ultimately ran and walked more than 83 miles, raising $27,000 for the American Cancer Society. The event has since raised almost $5 billion for cancer research and various cancer causes. Each team is expected to have at least one member walking at all times. Many teams have multiple walkers throughout the event. The Strollin’ for a Cure Team at the Relay For Life event. Ruth was scheduled to speak at the final ceremony, but she missed it because of the hospital visit. Andy said Monday he expects her to recover quickly.